In recent years, the state of Tennessee has aggressively pursued ways to mitigate stormwater runoff quality and quantity. As part of that initiative, Belgard Commercial has now installed over two million square feet of permeable interlocking concrete pavement (PICP) systems on various projects across the state. 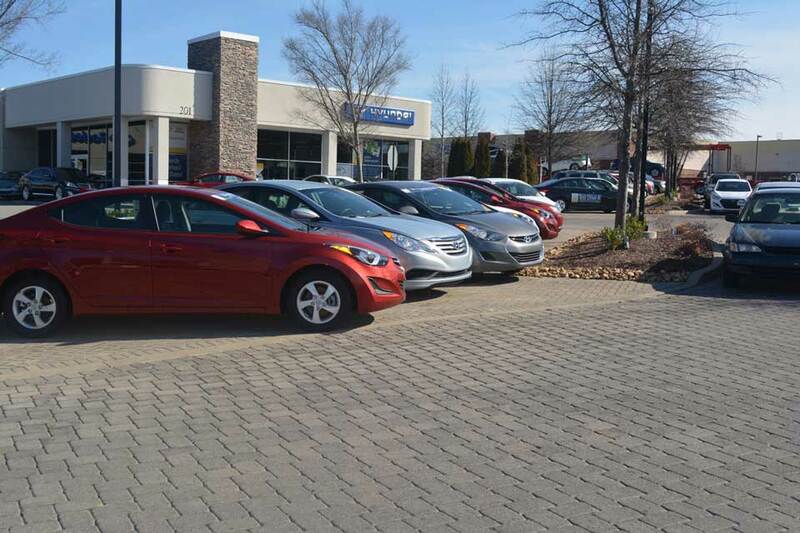 “The development, design, installation and regulatory communities have come to realize there are much better options than asphalt, storm drains, and storage ponds,” said Darryl Sapp, Commercial Hardscapes Consultant for Belgard Commercial. A good deal of these communities joined the PICP movement due to the efforts of Sapp and the Belgard Commercial team, who took an activist role in educating local municipalities and the design community on the effectiveness of PICP in satisfying national mandates to implement stormwater management programs to reduce waterway pollution by reducing the burden on both municipal separate storm sewer systems (MS4s) and combined sewer systems. 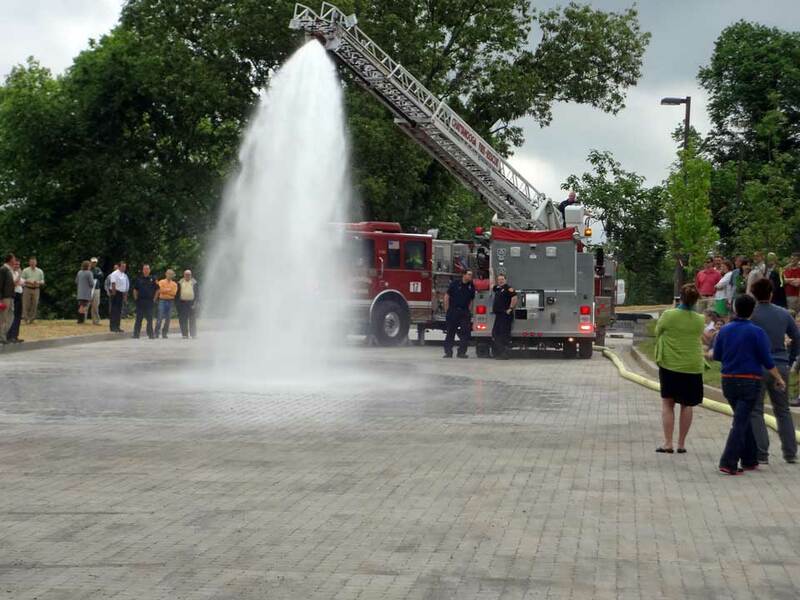 The Chattanooga Fire Department helps demonstrate the water infiltration rate of Aqua-Bric® Type 4 permeable pavers at the new eco-friendly Fairmount Avenue Townhomes urban housing project. As a landscape architect with engineering firm Ragan-Smith Associates, Inc., of Nashville, Alan Thompson is a proponent of PICP as a stormwater best management practice, thanks to the educational efforts of the Belgard team. “Belgard educated me on the system. I know what this system can do, and I’ve seen it function properly,” Thompson said. Because Thompson works closely with communities required to meet MS4 permit requirements for water quality, he understands why the square footage of PICP is rising so quickly in his state, compared to other areas of the nation. According to Thompson, the initial approach used to comply with MS4 guidelines was to use detention ponds to eliminate flooding, however this did not offer full compliance. “MS4 guidelines require that you not only detain the water, but clean it and minimize impact. With traditional asphalt, water flows at a high rate, takes pollution with it, and gets heated in the process, all of which alters the ecosystem,” Thompson said. A PICP system, however, incorporates interlocking concrete pavers over a bed of graduated open-graded aggregate that not only detains stormwater, but removes pollutants in the process. “With PICP, water goes into the system immediately without getting heated,” Thompson said, which prevents local stream temperatures from being elevated and potentially harming aquatic life. 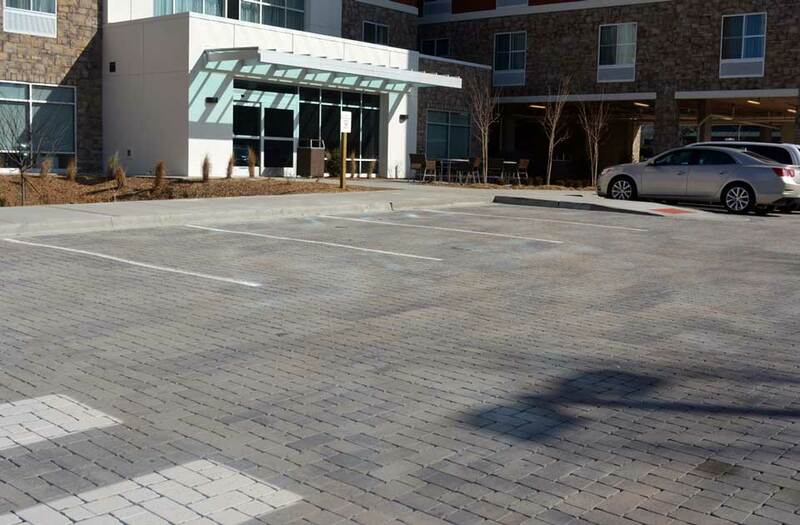 “Also, the paver color helps create an overall cooler environment by increasing reflectivity. When incorporated with a vegetative system, like a bioswale or infiltration trench, nitrates and phosphorous can even be removed from the water,” Thompson said. Although other permeable pavement systems are available, such as porous asphalt or concrete, Thomas does not recommend them to the municipalities he works with. 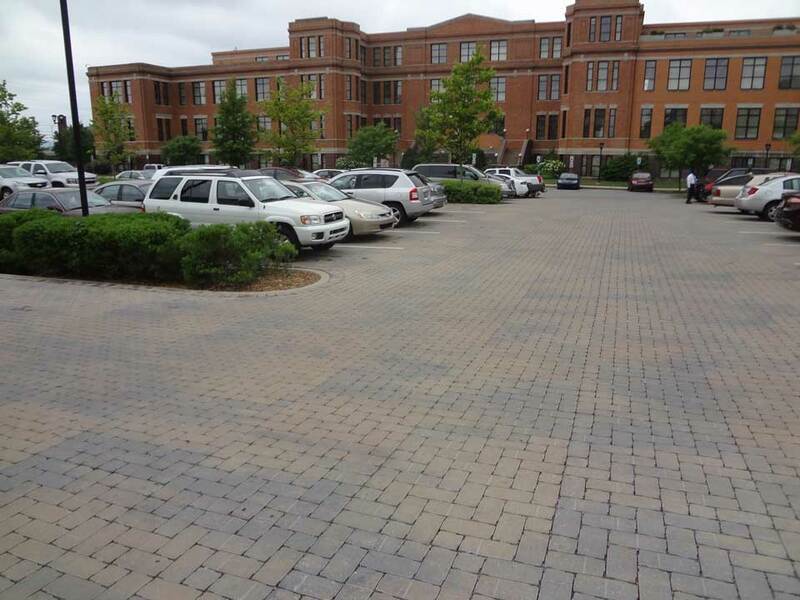 This Aqua Bric® Type 4 PICP parking lot replaced a failing porous asphalt lot for the Richard H. Fulton Complex of the Nashville Metro Water Services. Alan Thompson, Landscape Architect with Ragan-Smith Associates, Inc.
Seen by many of the state’s municipalities as a leading example in the area of stormwater management, the City of Franklin boast stringent green infrastructure laws and agrees with Thompson’s assessment. Various PICP projects have been installed throughout Franklin over the past six years, all of which continue to function well due to proper maintenance.